Smooth workflow is one of the reasons why Audio and Video Professionals prefer Mac to Windows. As long as you have the right apps, you wouldn’t face any glitches, per se. If you want to record audio for music production, podcasts or something else, you need the best audio recording software for Mac. By default, Mac allows you to record audio from Mac internal mic, which is fine if you want to take quick audio notes. However, if you want professional audio quality, we recommended using a USB mic like Blue Yeti. If you want to record system audio, install Soundflower on your Mac. Most the following Mac Audio recorder allows you to change audio source. Down below, we have covered some of the best audio recording software for Mac that you can use. 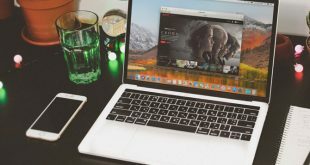 QuickTime, as you may know, is an inbuilt utility in macOS. It’s usually used for video/audio playback but it lets you record audio content as well. Just so you know, QuickTime also lets you record video using a webcam or a connected device. 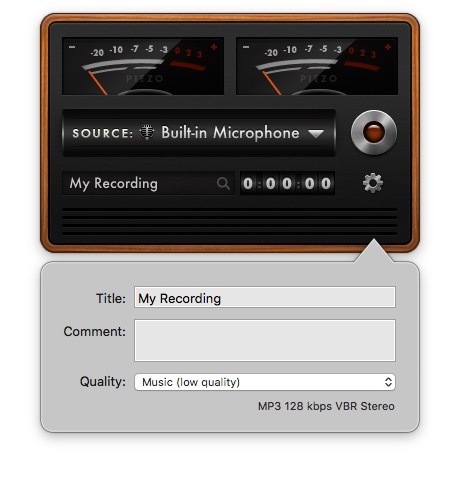 Now, coming to the audio recording feature of QuickTime, everything is super-easy. You have a really intuitive interface with minimal customization options. It’ll take you a few extra clicks to start recording audio with QuickTime. First, launch the app from the Spotlight, and go to File > New Audio Recording. For instance, QuickTime lets you change the recording source — pick between the internal microphone and the system audio (with SoundFlower). You can also change the Recording quality between High and Maximum. Once these are set, just hit the Record button. As the program records your voice, you can see the size of the recording file also. Once you’ve recorded the whole thing, you can export the file as MPEG-4 Audio file. However, there is no option to pause audio recording, you can only stop it and start a new one. QuickTime is the best Mac software for casual audio recording. It gets the job done — with minimum things at stake. You don’t have to worry about complex customizations or exporting. Everything you record will be available in a single file. That having said, we would not recommend QuickTime for professionals. 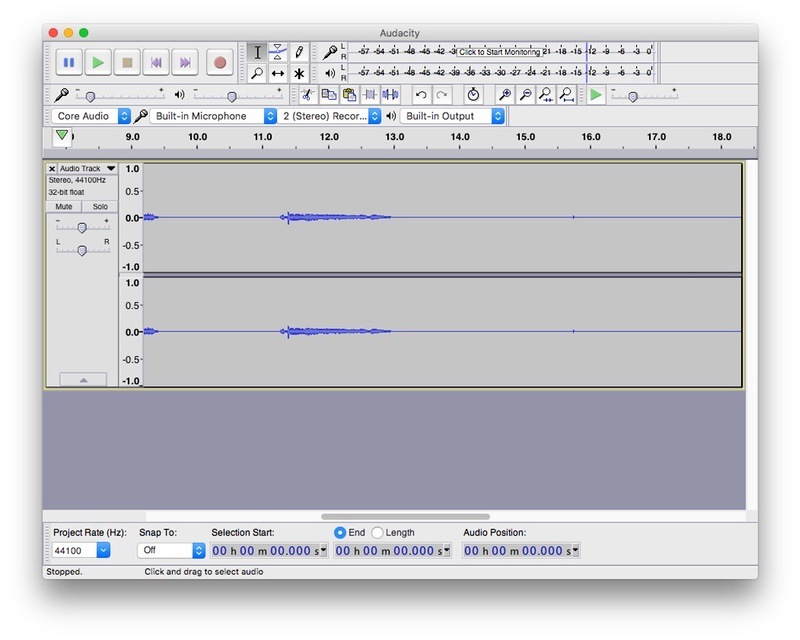 Audacity is a free and open source audio recording software for Mac. We use for recording audio for our YouTube channel. You have an option to choose the recording source (we use it with Blue Yeti mic), recording channel type, audio type etc. As you can see below, it does offer a wider range of control as well. But, the best part about Audacity for Mac is that it comes along with a bunch of editing tools. In fact, Audacity is a digital audio editor, first, and recorder later. Unlike QuickTime, Audacity lets you perform basic audio editing tasks like editing. You will also find options like effects, voice generation, noise removal, and track-based management. In case you are into professional audio recording and editing, there is a wide variety of Audacity plug-ins to choose from. Another bright side is that you will be able to export the audio recording in almost any format. The reason, why we prefer Audacity is because it’s cross-platform support (available for Windows, Mac, and Linux) Just as Photoshop save the file in PSD and have all the properties intact, you can save audacity files in AUP, which can be later open and edited from any computer that audacity installed in it. As we said, Audacity is made for professionals. Did we say that Audacity is free to use? It’s free, open-source and cross-platform. Considering the features you get, it’s an awesome deal as well. At least, you would not have to worry about paying a huge amount for your DAW. 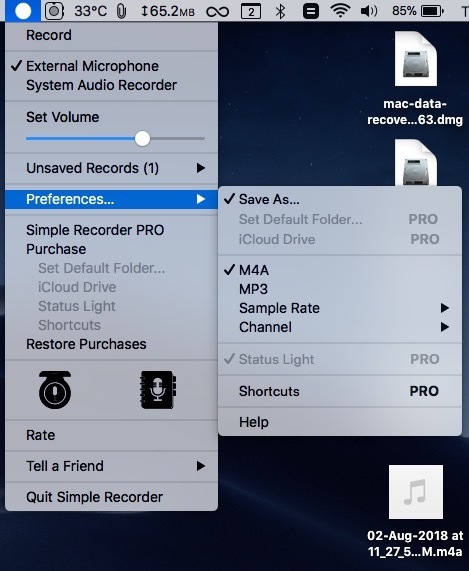 Simple Recorder is a truly simple solution for audio recording in Mac. It doesn’t come with many bells or whistles, but it gets the job done. 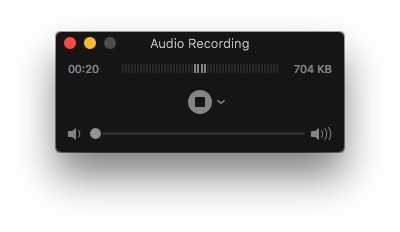 Unlike QuickTime and Audacity, which takes multiple mouse click to start the recording, Simple Recorder sits in the menu bar and can start the audio recording in just two clicks. Best solution when you want to take quick notes. You can select the source of recording from the drop-down menu. It also lets you set up the volume. In just a single button, Simple Recorder would start the recording process. In the Preferences section, you can pick the recording format, Sample Rate, Channel etc. There are some Pro features like Status Icon, Shortcuts and some levels of Automation. 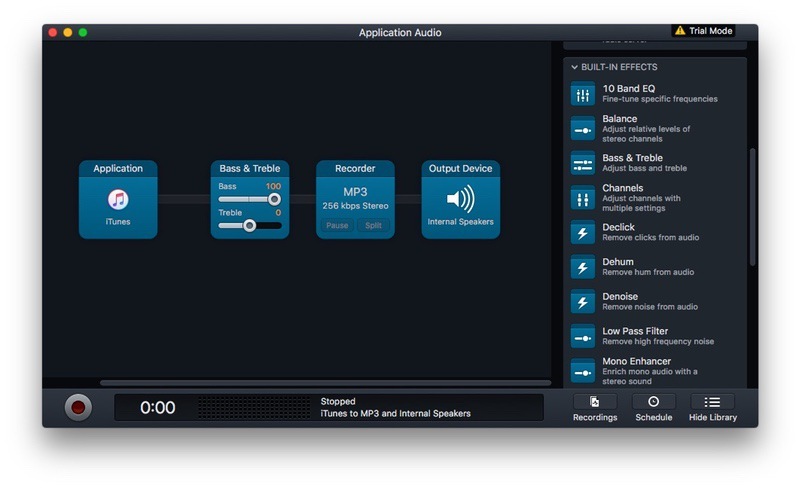 Simple Recorder is the best Mac audio recording app for the intermediate users. 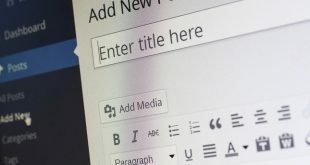 Unlike QuickTime, it offers a standard set of customization options. That having said, unlike Audacity, the features aren’t that suitable for professionals either. So, if you think you need somewhat control over recording, go for this. Technically speaking, GarageBand is a digital audio workstation, not a digital audio recorder (like QuickTime) or a digital audio editor (like Audacity). In simple words, if you are into recording audio for music production, GarageBand is one of the best choices in town. It’s rich with features and offers the best level of compatibility. Last but not the least, you’d not have to pay a single penny for this program. Like Audacity, GarageBand supports MIDI recording and editing out of the box. However, unlike Audacity, GarageBand has a smaller learning curve and is more stable. Also, it’s compatible with any iOS device. Although it’s a fully-fledged DAW, you don’t need rocket science to record audio using GarageBand. It even has a dedicated mode for Voice, where you can also select the type of voice recording. For instance, it offers different options for recording Narration Voice and Bright Voice. Just hit the Record button and you can do the exporting part later. GarageBand is the recommended choice for professionals out there. If you need the best quality, control as well as performance, you should go for this built-in tool. 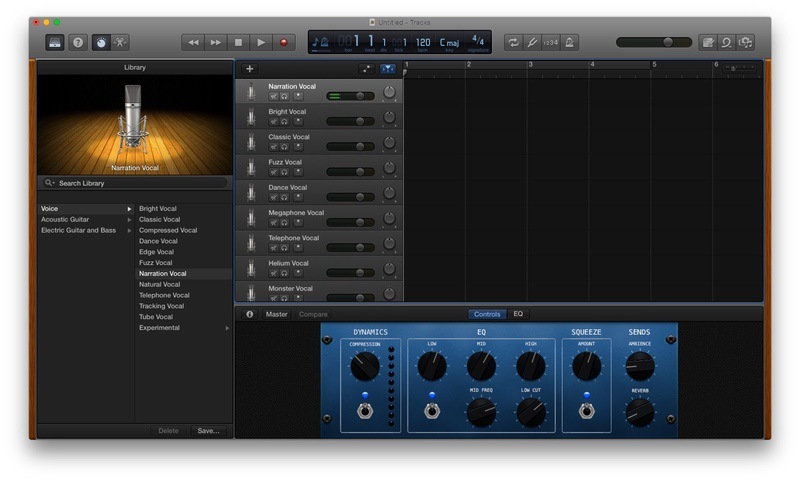 Although the UI is simple, learning GarageBand will surely help you as an audio professional. Piezo from Rogue Amoeba is a simple and wonderful audio recording software for podcasts. If you want to make some amazing podcast recordings with precision, you can count on Piezo. Unlike all of the tools we’ve talked about earlier, Piezo lets you record voice from popular apps like Chrome, Skype, FaceTime, Messages etc. It is one of the best features for getting precise podcasts, you know. Settings in Piezo are very easy to manage. That having said, it lets you change the Music Quality only. Still, you don’t have to do guesswork here. Piezo has set up some quality pre-sets for music, audio, spoken word etc. By default, the recordings will be saved in MP3, which is convenient for most people. Just as you can see, the interface is a bit unconventional. Piezo is the best audio recording software for doing podcasts on Mac. You can simply record your own voice or get inputs from common apps like Chrome or Skype. It is basically minimal but you have options to extend the capabilities of Piezo. Macsome Audio Recorder is one of the voice recorders that promise to do almost anything. 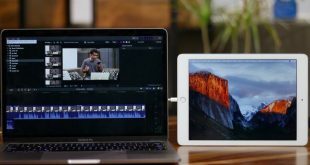 Without bringing all the professional features, Macsome Audio Recorder lets you record audio from multiple sources such as the internal microphone, different apps on your Mac and other hardware. Unlike some other apps, however, it doesn’t offer any kind of optimization. Despite all these features, the program has a minimal footprint to offer. Did we say mention that Macsome Audio Recorder has one of the best recording management interface as well? You can even use ID tags for organizing your recording files. We really liked how Macsome Audio Recorder works. You can add separate recording profiles for apps/hardware and start the recording process in a single click. 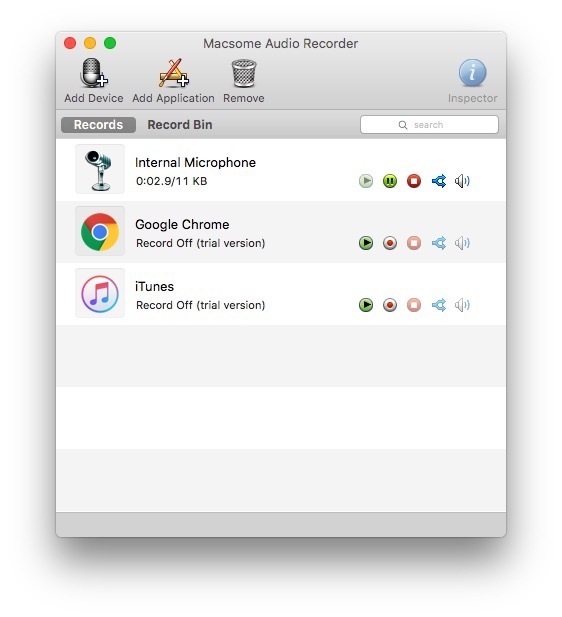 As it promises, Macsome Audio Recorder is one of the best all-in-one audio recorders for Mac. It might not have the best UI in town, but there are many productive features. When you want a tool that records podcast, music, and speech with the same efficiency, Macsome Audio Recorder would be our take. We already talked about Piezo from Rogue Amoeba, right? Audio Hijack is also from the same developer but it offers advanced features and control. Inside a nice package, you will find tools for recording almost every type of audio from your Mac. You can even use Audio Hijack for scheduling recordings. It would be the best option when you’re recording audio from the web. The best part is that Audio Hijack comes with different session templates — you have one for internet radio, DVD Audio, Application audio and Web Audio etc. When it comes to Application mode, you can pick an app from the list and start recording. You can also check out a bunch of built-in effects and filters in Audio Hijack. It also has an interesting UI that lets you manage how the recording process works. Overal Audio Hijack is one of the best audio recording software for Mac if you are looking for advanced features. Audio Hijack is one of the very few Mac audio recording software that is worth paying for. You get a whole bunch of features like filters, effects, and top-to-bottom control. Even if you’re not into it, you can get a cool audio recording and management experience. AudioNote lets you combine a note-taking app and audio recording app. This is how it works: you can open AudioNote and start recording the lectures, interviews or something else. When you make notes on the screen, it will be synced with the audio. So, during the playback, you can listen to the audio as well as seeing all the notes on the screen. There are some really cool features too. For instance, you can tap on one section of your notes to jump into the corresponding section in audio. 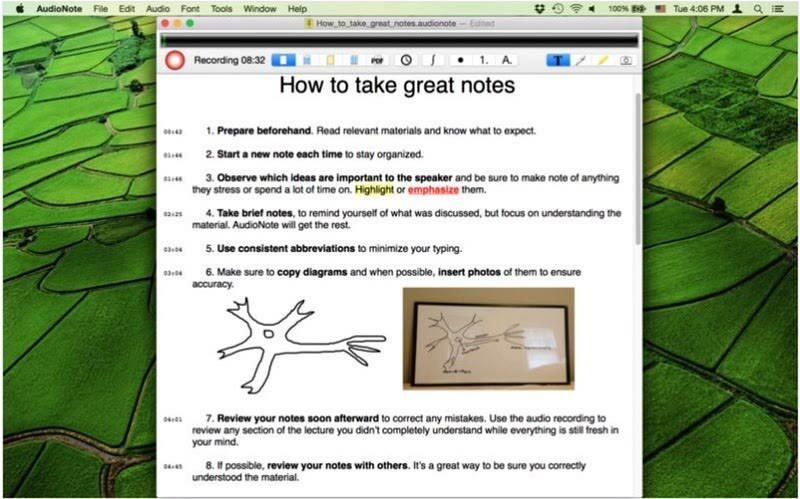 As a note-taking software, you can bring text, shapes, annotations and a lot more things. Once you are done, you can also convert your notes to a PDF document. The best part is that you have everything in sync. AudioNote is the best option for students and professionals alike. With this tool in your hand, you don’t have to worry about getting the list in the notes. You would know what the professor was talking about when you’d written something. Pretty cool, isn’t it? Well, these are the different kind of audio recording software for Mac, for different needs. For your day-to-day casual recording needs, Simple Recorder is the best option, indeed. On the other hand, if you are into the world of podcast recording, go for Audio Hijack from Rogue Amoeba. Options like GarageBand as well as Audacity are for those who need professional-quality control over the recording quality and process. Still, you can take an effort to step up the game.